In my last blog posts we dove into the best features to highlight when presenting the Visual Production and Jobs Schedulers. In this post, I want to take the same kind of look, highlighting the three top features to show when demoing their little brother - the Visual Service Scheduler. This blog post will dive specifically into the Visual Service Scheduler for Dynamics NAV and it most loved features during demos. 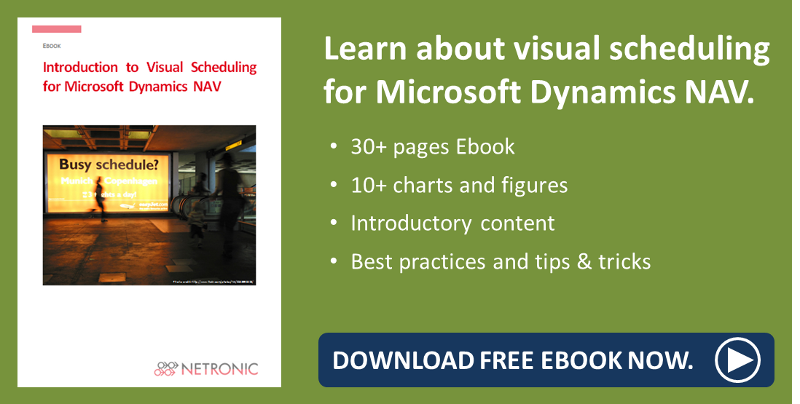 Therefore it's to be expected that a presenter of the Visual Service Scheduler for Microsoft Dynamics NAV services modules will often hear reactions to three key features shown during demonstrations. These features are for me the basis of presenting the Visual Service Scheduler and its capabilities in NAV. My goal here is to explain and show them so that the next time you are demoing them you will be able to give the best possible demo. The integration is expected and needs to be shown. This can be shown effortlessly by utilizing the data already found in NAV. Double-clicking on a resource, allocation, or not yet allocated service order will automatically open the corresponding card in NAV. This is your visual dispatch board at its finest. The main portion of the screen is taken up by the Gantt chart where you can see your resources, their working and non-working time, and which order or tasks have already been allocated to which resource. The Gantt chart represents your service schedule. To the right you have your order backlog. This is all service order lines which have not yet been allocated to a resource. Below you can see how simple dispatching a service order is as a service order line is taken from the right order backlog and dragged and dropped onto an available resource in the Gantt chart. Here is an additional feature which will make planning much easier in NAV. In the standard NAV service module you are able to assign a service order line to a group. You can therefore in the Visual Service Scheduler also take an allocation either on the group or individual level and split that allocation into two. This would allow you, such as in the example below, to allocate a bulk sum of hours to the group level and go in at a later time a split that bulk amount (as many time as you want) across the individual resources of that resource group. Note that every time you split you are creating an additional service order line belonging to the parent service order. Okay so three key features to highlight when showing the Visual Service Scheduler.